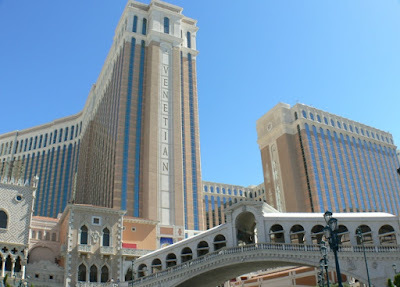 Where the streets are paved with water.............we decided to check out the VENETIAN on Friday morning. The moment you step through the door your senses are bombarded with the sheer grandeur of Venice brought to life right before your very eyes. From the hand-painted frescoed ceilings to the statuary placed throughout the hotel everything was marvelous. The Grand Canal Shoppes was were Cody and I took an authentic Gondola Ride complete with our own serenading Gondolier - and she had the most amazing voice. There were even performers in the square before, after and during our ride. The "living statutes" were kind of creepy but they will apparently do anything in Las Vegas to keep you entertained. 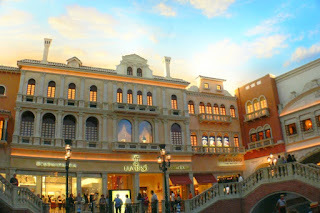 The Venetian was definitely the most unique hotel we visited. I hope that so far you have enjoyed hearing about our trip. I'm also in the process of uploading photos onto Flickr. Great trip you guys had. Never been to this one, but all of them are a site to see. Love hearing of memories we have made to share. You lucky dog! I have always wanted to see the Red Rocks! Thank you for posting the lovely pictures.